Each year local celebrity chefs create a complete dinner presenting on stage cooking demonstrations to accompany each course. 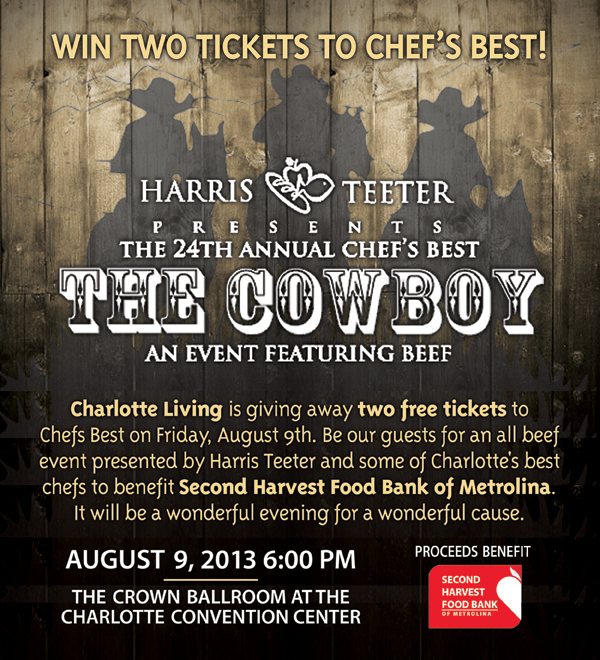 With Harris Teeter as the event’s major corporate sponsor, this year the opening reception will be presented by chefs and culinary students from Charlotte’s Campus of The Art Institute. Smoked chicken on a black bean cake; Tomato gazpacho with shrimp; Jalapeno and chorizo deviled eggs; Bruschetta with roasted peach and bacon; and roasted pork and pickled cactus on tortilla. A seated dinner in the Crown Ballroom in the Charlotte Convention center will follow the reception. Chef Gene Briggs and Chef Tom Condron, both long time supporters of the Chef’s Best event will kick off the evening with presentations of the soup and salad courses, respectively. Chef Gene, executive chef at Blue and Osso will present a seasonal Yellow Tomato Gazpacho garnished with Cecina (a Spanish air dried beef) and Chef Tom of The Liberty and the soon to be opened Lumiere will prepare a Steakhouse Style Beef Bacon and Blue Cheese Wedge Salad. 24 Hour Braised Beef Short Ribs and Roasted Diver Scallop with faro risotto, fennel confit, pickled peaches and sorghum glazed carrots from Chef Jon Fortes of Mimosa Grill and Chef Tom Dyrness of Upstream. Dessert, a Summer Berry Cornmeal Shortcake, with Whipped Mascarpone and Basil and Mint Syrup will be presented by Chef Stephanie Nicolic, pastry chef at E2 Emerils Eatery in Uptown Charlotte. This year’s Chef’s Best theme is “The Cow Boy”, with a beef-centric dinner menu, but vegetarian options will be offered upon request. Wines at the reception and with each course at dinner will be paired and presented by E&J Gallo. A lively live auction will take place during the dinner- with fabulous gifts, dinner and travel opportunities for the lucky high bidders. Last year the 23rd annual Chef’s best raised $165,000. organizers are hoping to top that figure this year. Tickets are $100 per person and are on sale now at the Second Harvest website under the events tab.